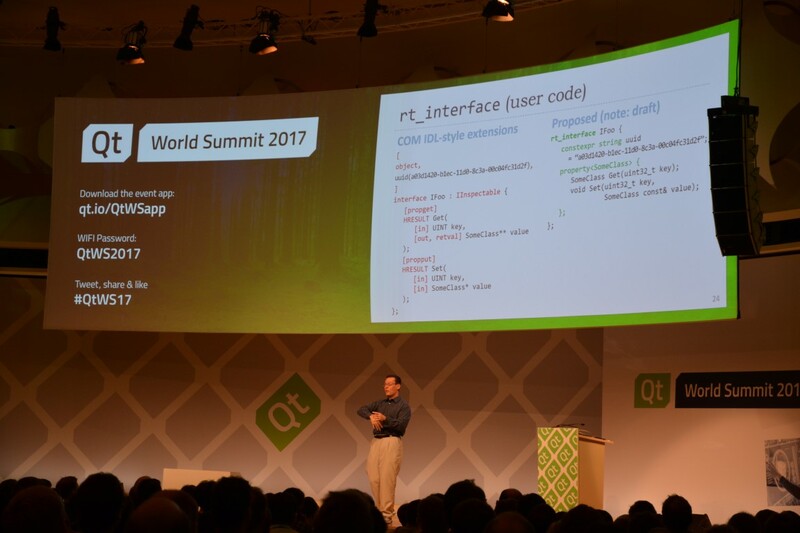 From 10-12 October 2017, the annual Qt World Summit attracted an international crowd of Qt developers, UX designers, C++ enthusiasts and innovative product managers. 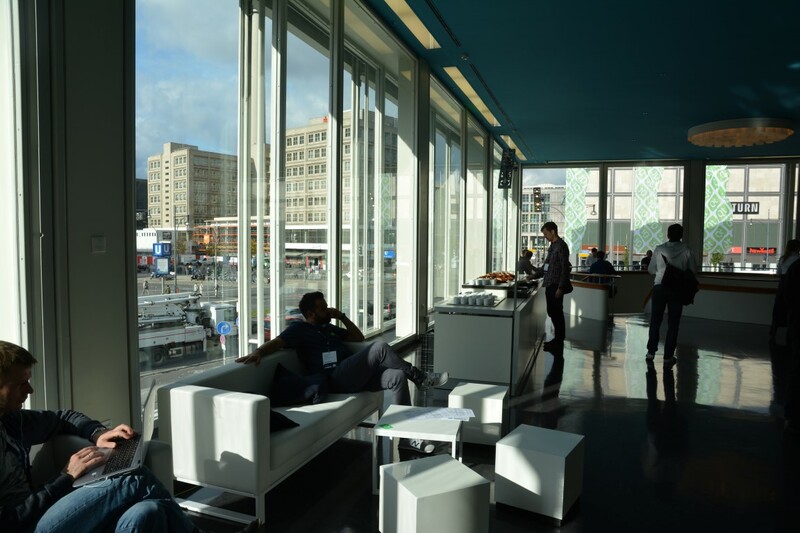 The event, which took place at the the Berlin Congress Center this time, served as a platform for innovations and ideas within the Qt fields of expertise. 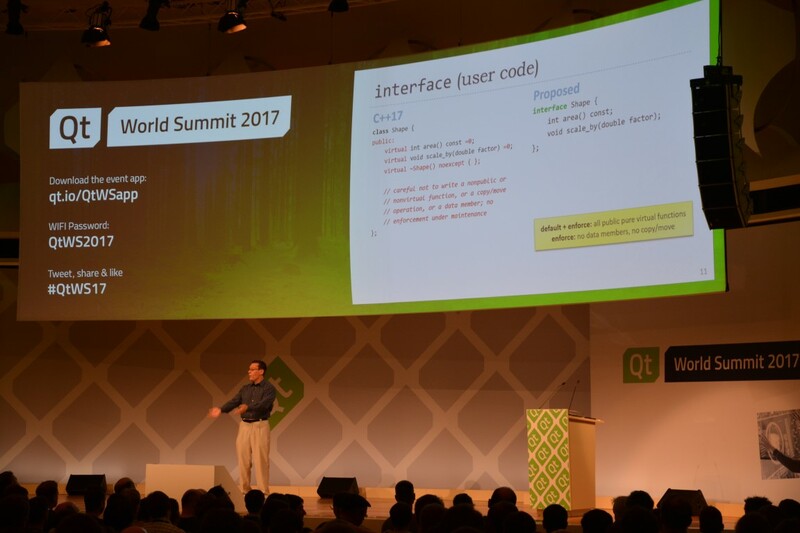 It became apparent that the Qt community and partners have gained momentum: In addition to several renowned software consulting companies, this year's Qt World Summit was supported by well-known speakers such as C++ guru Herb Sutter and CERN scientist Steven Goldfarb. 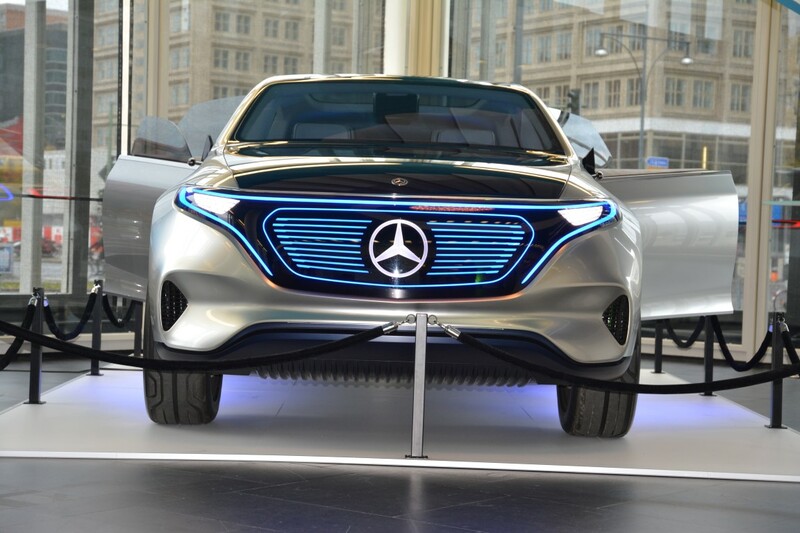 In addition, the world-famous automobile manufacturer Mercedes Benz presented their latest Qt-based full electric car concept EQ (see header image on top of this post). 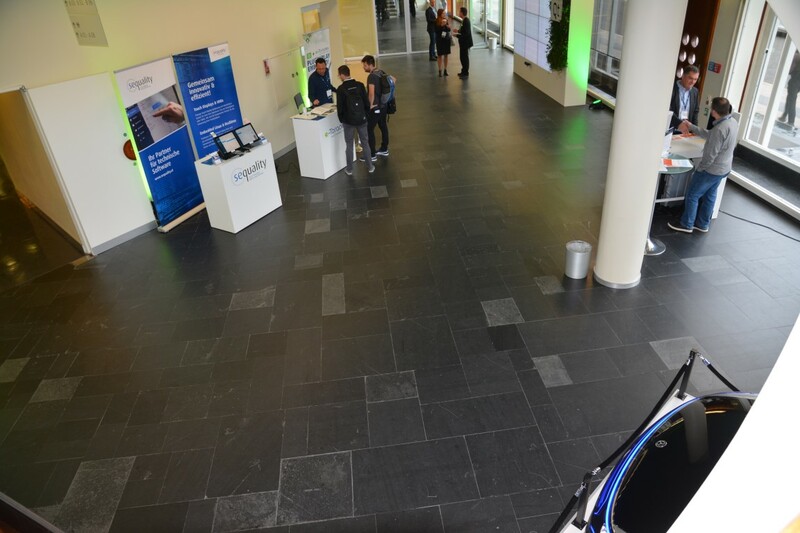 In the course of the 2017 Qt World Summit, more than 1,000 visitors showed up at the Berlin Congress Center: The high amount of guests indicates that there is an ever increasing interest in Qt-based applications. 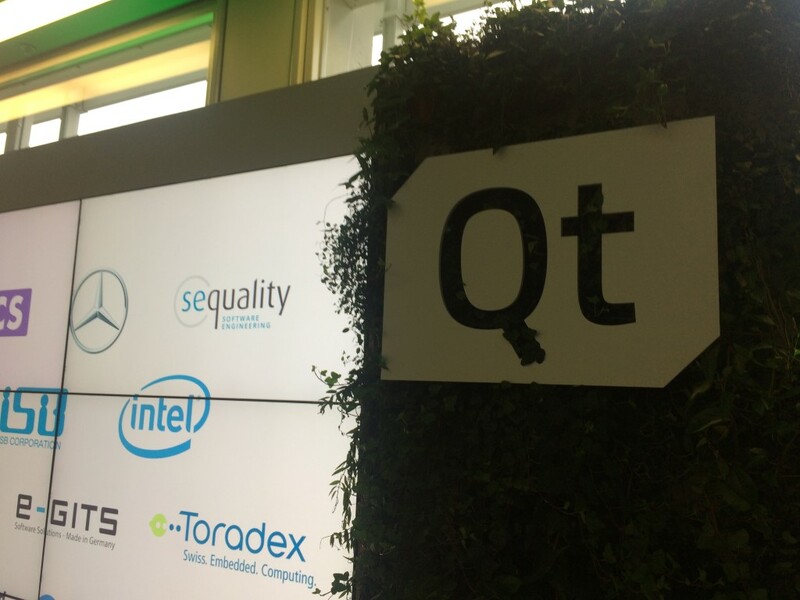 For sequality, being part of and contributing to the worldwide Qt movement (The SEQUALITY whitepaper „Qt vs. HTML5“ has been the resource most frequently downloaded from www.qt.io during the last months.) has been a very exciting experience. 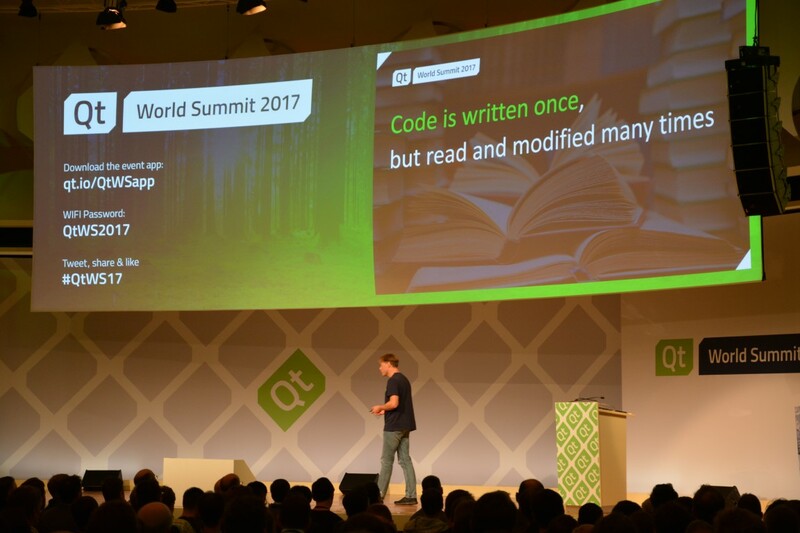 In our point of view, the Qt World Summit was not about exchanging know-how and getting a glimpse on future trends only: We greatly appreciated getting to know the people behind the technology, as well as communicating face-to-face with the masterminds responsible for the community, as well as for the technology as a whole. Over the past years, the topic of virtual cockpits has attracted an augmenting interest: An increasing amount of automobile manufacturers has started releasing virtual cockpits instead of the traditional mechanical instrument cluster for speed, engine rpm, fuel gauge and emergency indicator lamps. 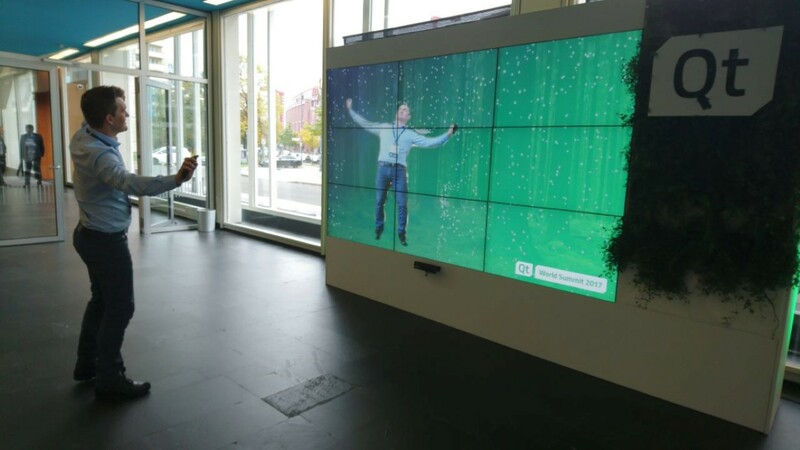 This trend is currently very strong within the Qt community: No matter which corner we visited at the fair – digital virtual cockpits were on display everywhere! 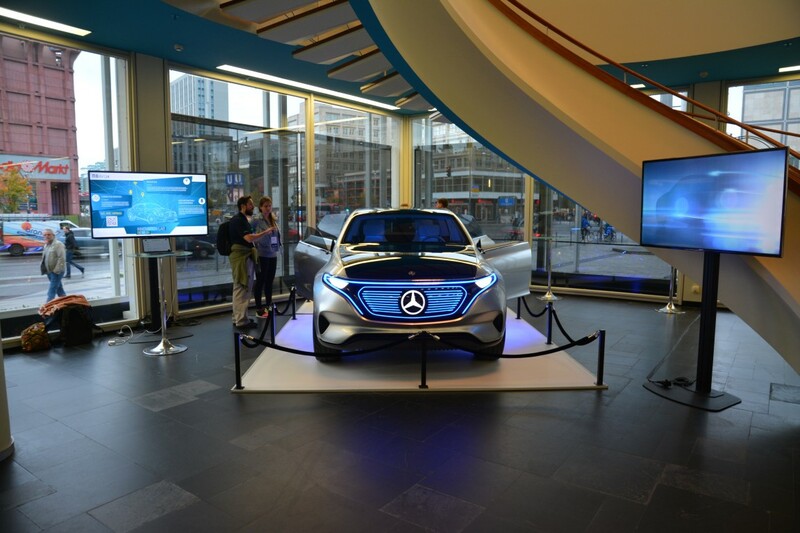 To start with, Mercedes Benz presented thier new concept EQ fully electric car right at the entrance of the Berlin Congress Center (Sequality happened to be very favourably located opposite of the Mercedes concept car, which gave visitors an excellent chance to get a glimpse of the demos and case studies we presented at the Qt World Summit.). 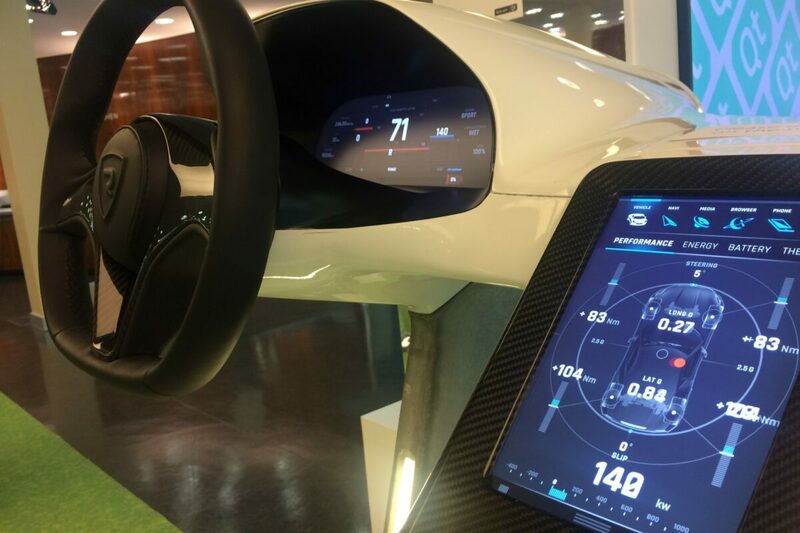 Secondly, another fully electric car based on the Qt instrument cluster was on display: The Rimac Concept One electric supercar recently got a lot of publicity due to the fact that Top-Gear anchorman Richard Hammond had a car crash while driving a Rimac this spring. 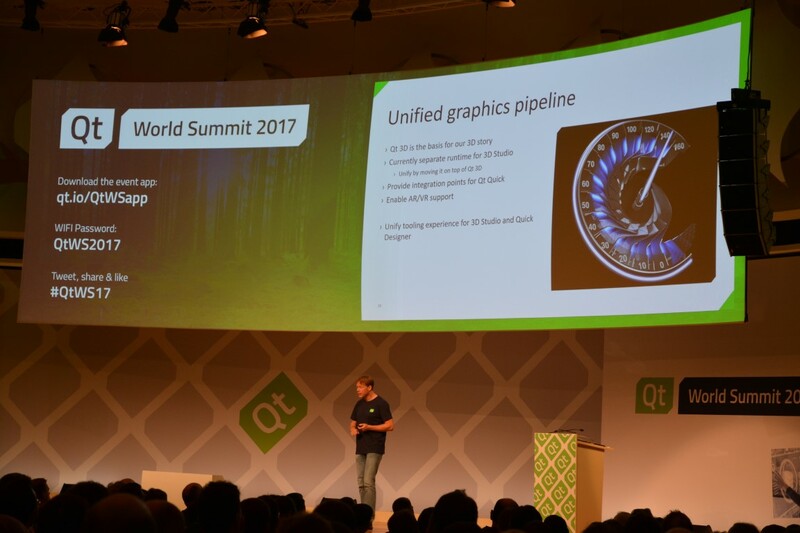 Furthermore, a live demo of the new Ford Mustang, as well as a wide range of other 2nd and 3rd tier automotive supplier demos in the area of virtual cockpits were presented at the Qt World Summit. 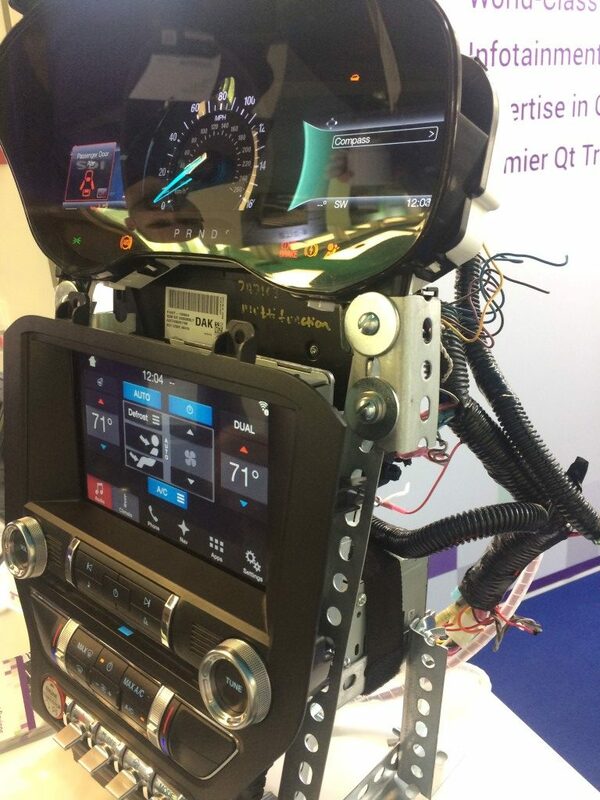 It seems that the automotive industry has started embracing open standards based on Linux technologies, which have a vast, innovative and stable IT-tech community at its core. 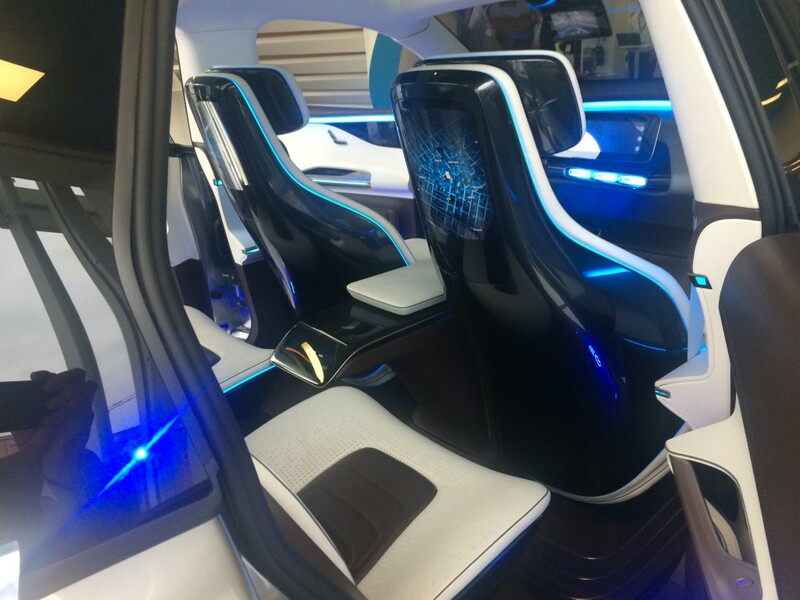 It appears that the automotive industry currently favours open technology standards over specialized niche-solutions which are company-solution-provider-specific and not based on open industry standards. 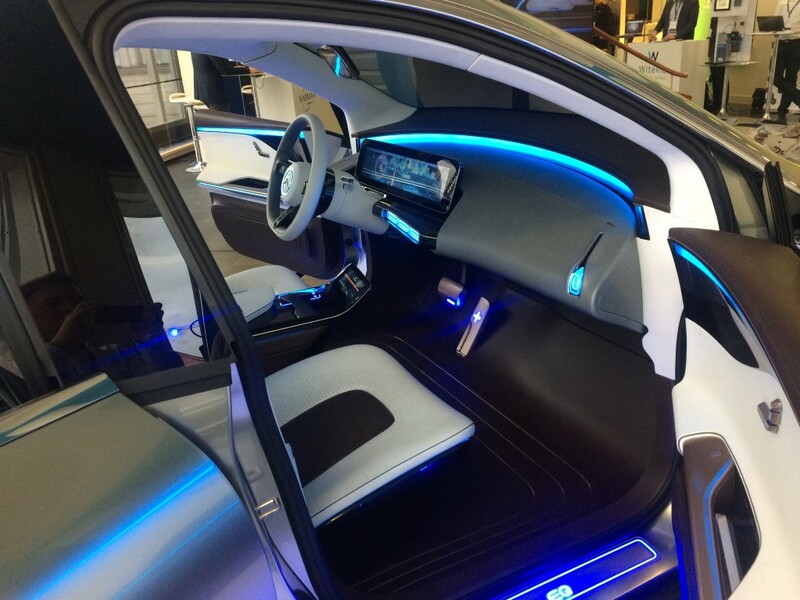 The basis for this trend was already laid out two years ago at the 2015 Qt World Summit, when the Qt Automotive Suite was presented for the first time. 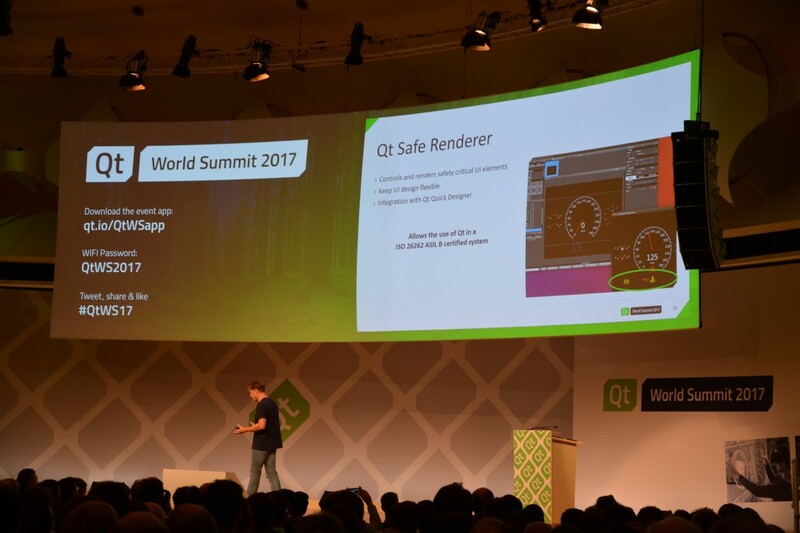 When taking advantage of Qt for safety-critical devices, it needs to be ensured that specific safety standards are met. As far as the automotive industry is concerned, the following question is raised on a regular basis: „Can we get rid of the LED lights indicating ABS, engine failure or other saftey-critical information?“. 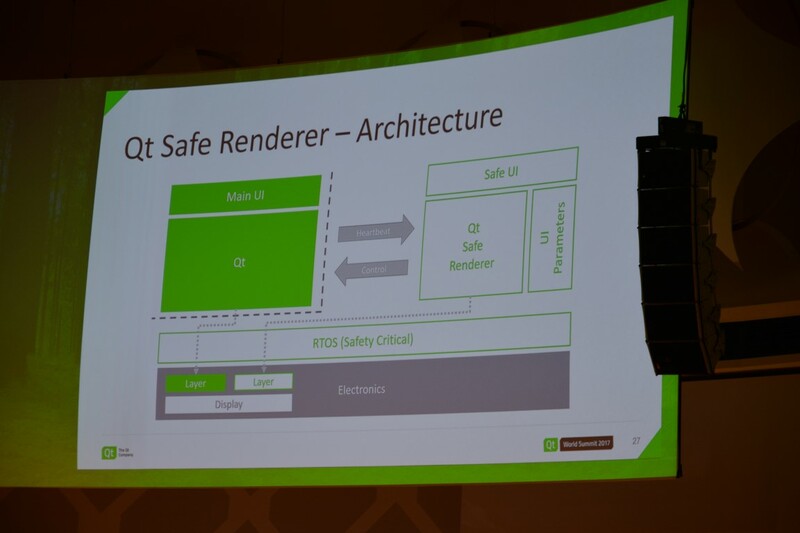 The Qt Safe Render (as part of the Qt Automotive Suite) could be one solution: Its mechanism is somewhat simpler, rendering bitmap graphics into an independent realtime operation process that is capable of rendering safety-critical information in case the Qt-/QML-based application has a defect. 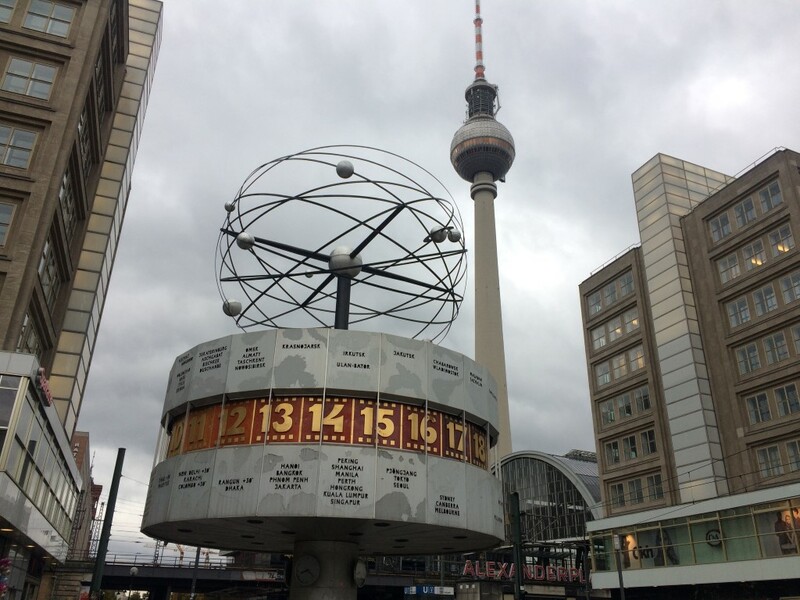 Also related to this topic are fast boot-up times für Qt-based embedded Linux Boards: Check out this video I took with my cellphone on the fair. 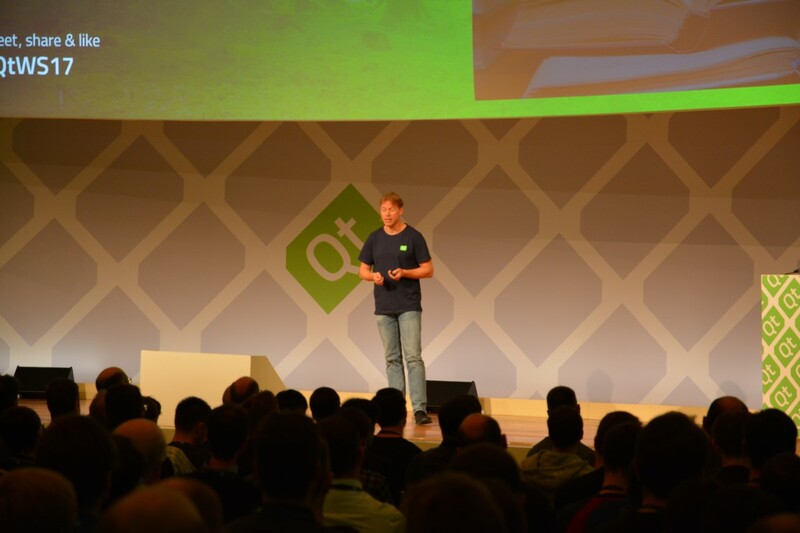 Lars Knoll, Chief Maintainer of Qt and CTO of The Qt Company, presented an interesting preview on how the framework is going to be developed in the next months. Some of the most interesting points raised in our opinion were releated to Qt 3D. 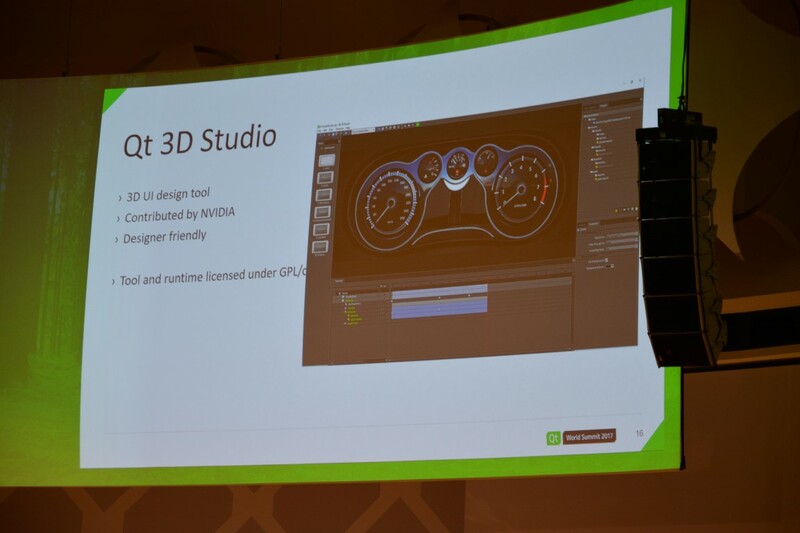 In the long run, Qt 3D will be integrated into the standard Qt Creator development environment. As such, it will assist developers in providing even more fascinating user experiences. 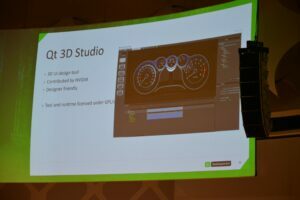 Mr. Knoll’s announcement backs up the trend of visualising 3D-graphics for devices controlled by a Qt-based (touch display) software. 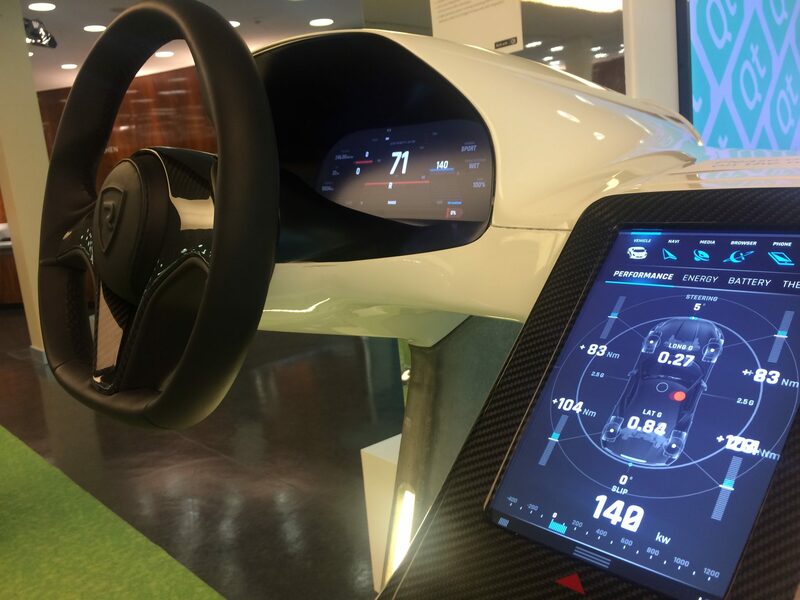 It will be possible for example to visualise a complete 3D-model of a car in realtime and provide the user with up-to-date 3D-information on a specific car component. 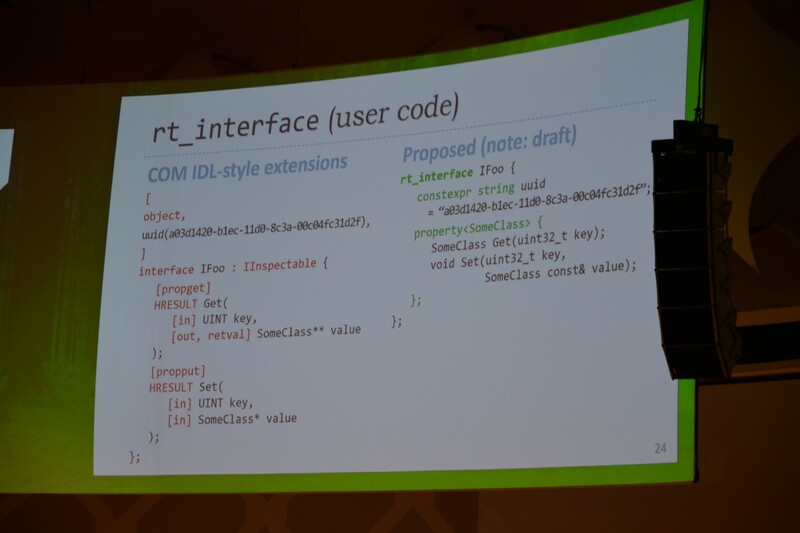 Herb Sutter, the leading C++ expert and chairman of the ISO C++ standards committee, introduced new features planned for C++ that can be useful for the Qt community: It seems that additional support for developing simple C++ interfaces with meta information is going to turn into reality in the foreseeable future. 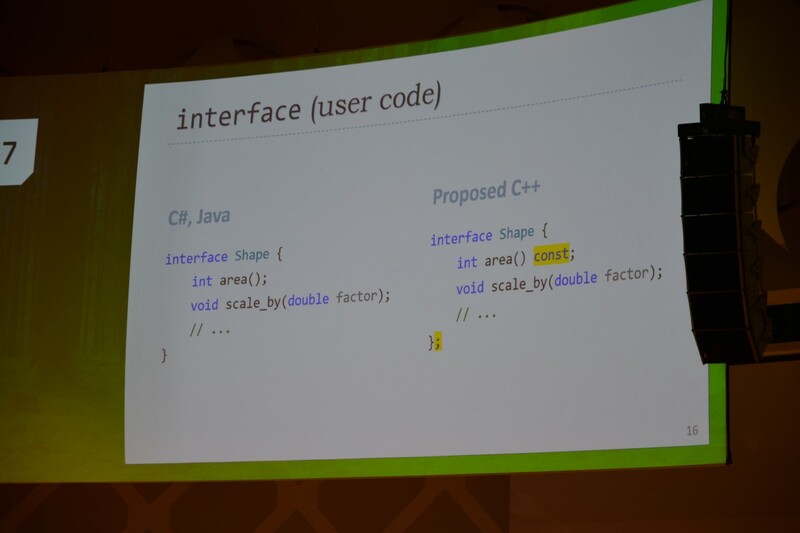 Mr. Sutter explained his proposal for a future strategy to ship new C++ language features without having to release new C++ compilers. 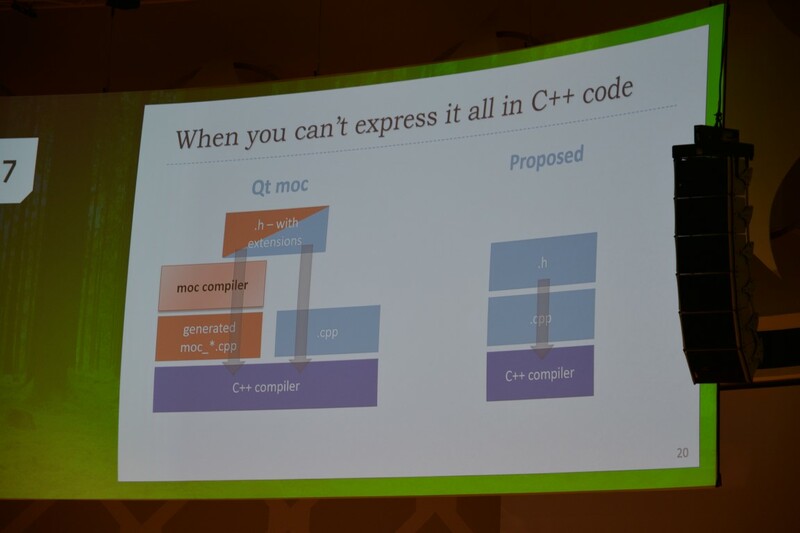 This mechanism could help future versions of the Qt framework to get rid of the moc (Meta Object Compiler) tool and provide reflection information within the framework without having to generate separate moc-files during the build process. 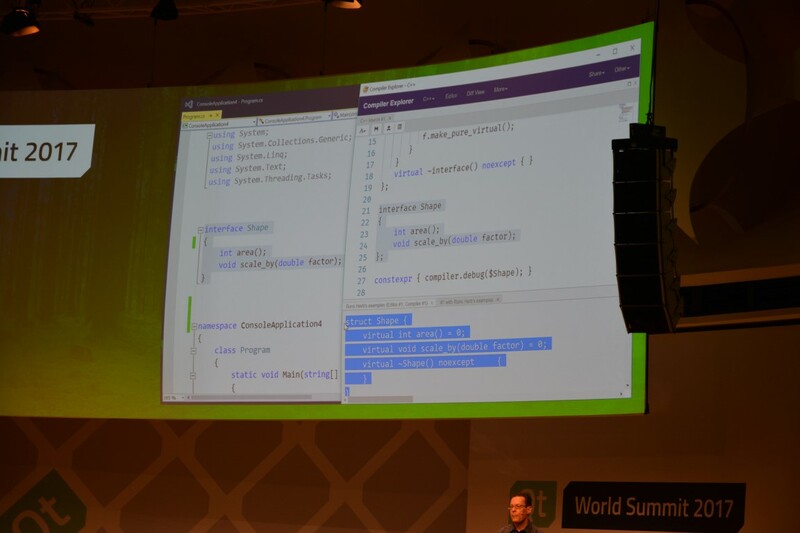 This could as well speed up compile times and provide better compiler diagnostic messages. 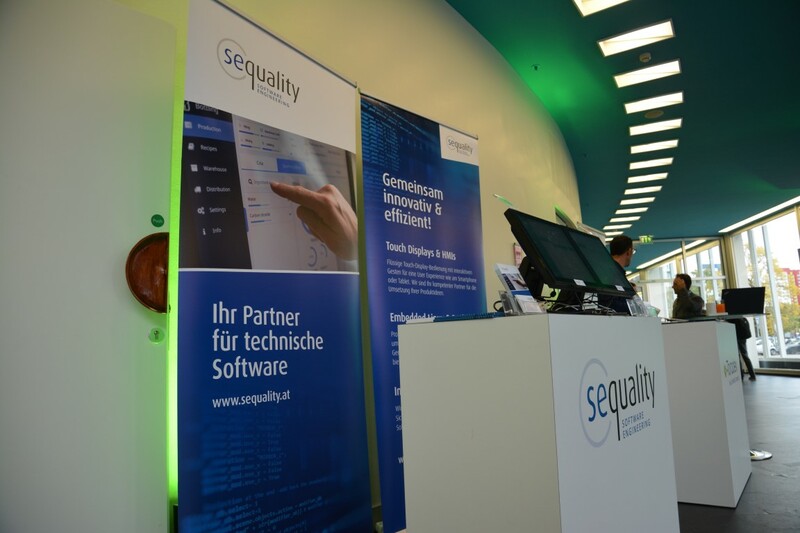 Sequality presented the demo „HTML5 vs. Qt“ at our booth: We had lively discussions with developers and experts with regard to the experiences they had had when making use of one or both technologies. Often, the question was raised which of the two technologies would be the best fit for their product environment. 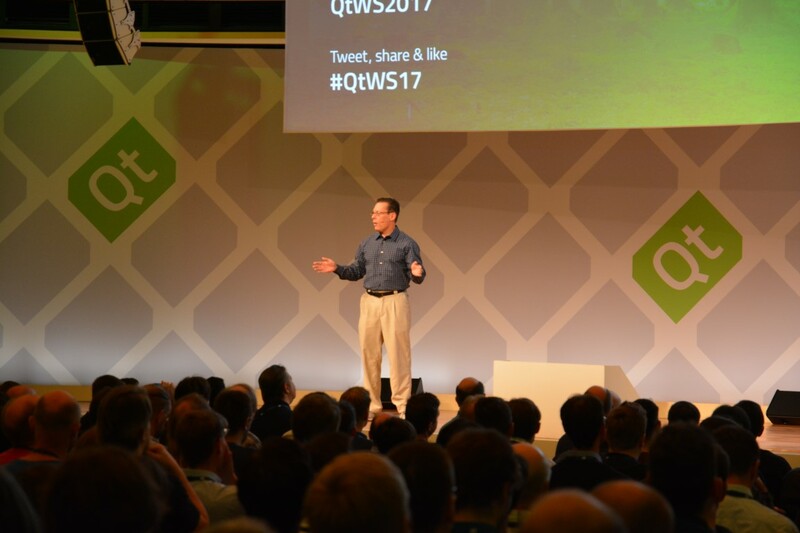 In addition to our contribution, there was a very interesting presentation by Burkhard Stubert on „Qt vs. Web – Total Cost of Ownership“. 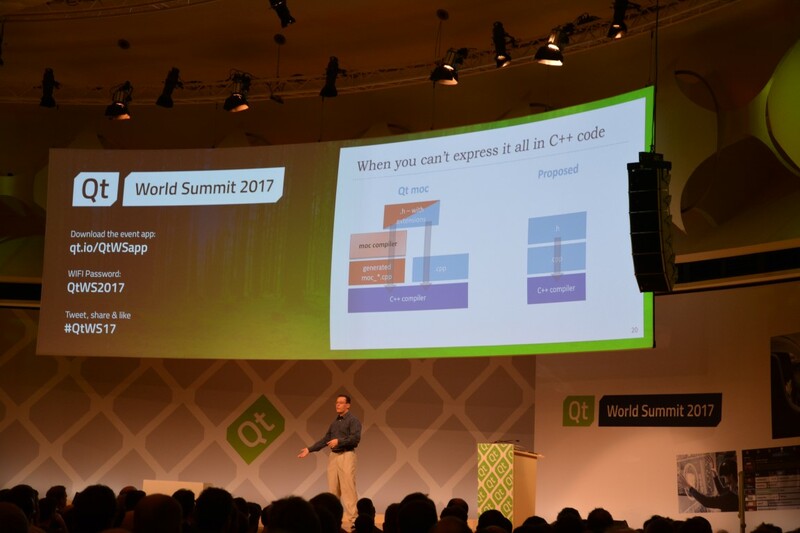 During his speech, Mr. Stubert came to a conclusion similar to SEQUALITY’s, which is laid out in our whitepaper: To guarantee an excellent user experience for a medium-sized application, the overall costs for developing a HTML5-based solution (including device hardware and software maintanance) are higher than compared to a Qt-based application. 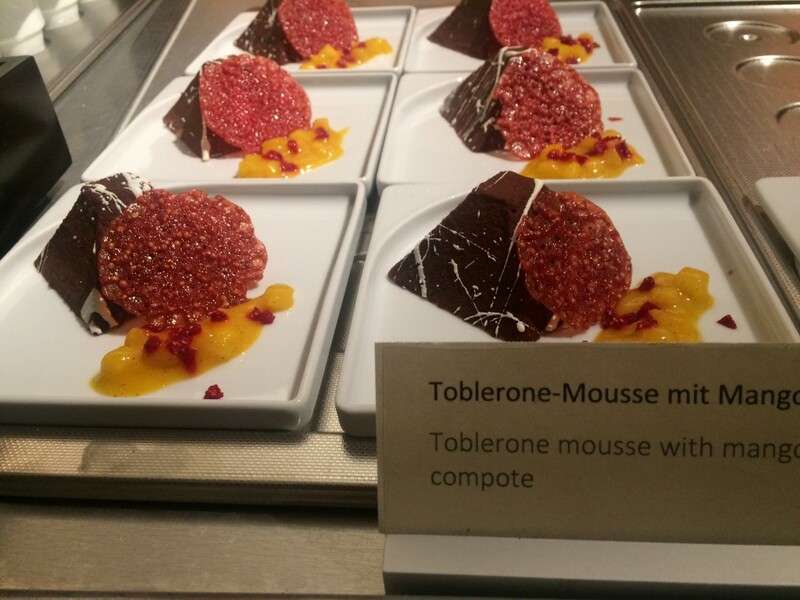 Furthermore, HTML5-based applications have disadvantages with regard to controlling the details. 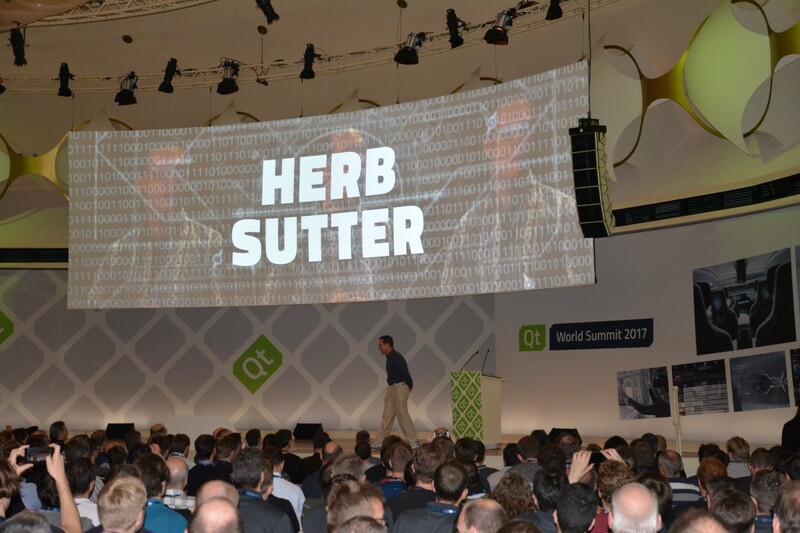 On November 20, Qt will host a Meet Qt Seminar at Mercure Hotel Westbahnhof in Vienna. 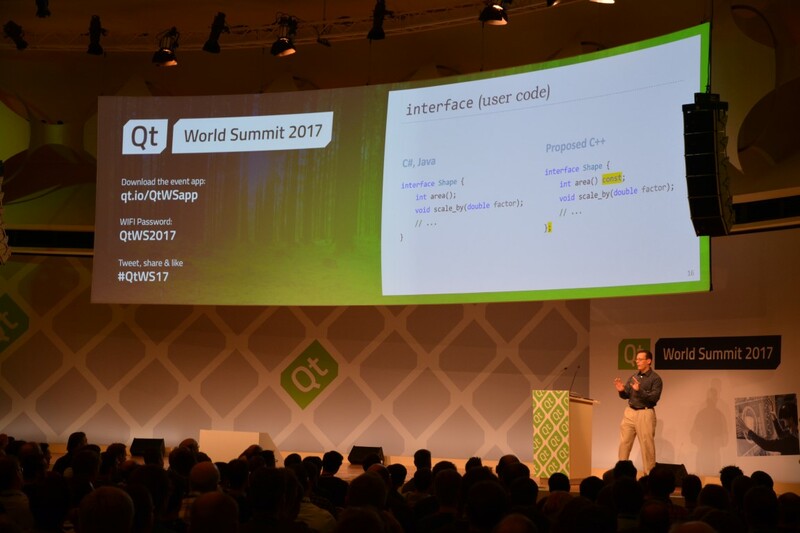 Throughout the meeting it will be possible to get an exclusive overview on Qt technologies, key features and the latest developments with regard to future device creation and software applications based on Qt. 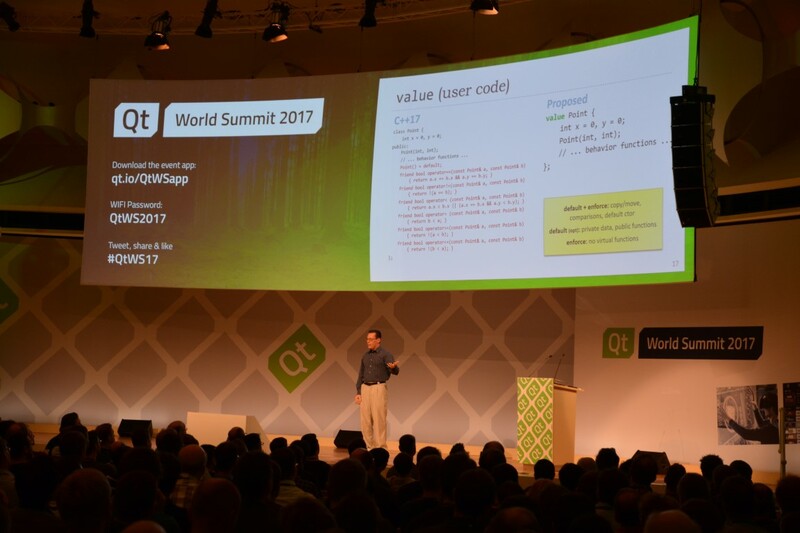 SEQUALITY is invited to demonstrate and share our experience on HTML5 vs. Qt. 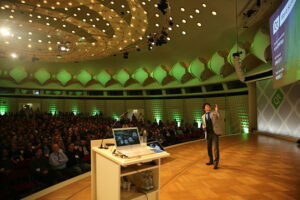 Join us in Vienna and klick here for further information and free registration.